For other uses, see Deltoid tubercle. In human anatomy, the deltoid tuberosity is a rough, triangular area on the anterolateral (front-side) surface of the middle of the humerus to which the deltoid muscle attaches. ^ Gray, Henry (1918). Gray's Anatomy. ISBN 1-85958-018-1. ^ Feneis, Heinz (2000). Pocket Atlas of Human Anatomy (4th ed.). Thieme. p. 36. ISBN 3-13-511204-7. ^ Fink-Bennett D, Vicuna-Rios J. (1980). 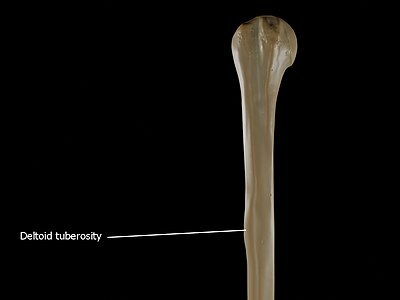 "The deltoid tuberosity--a potential pitfall (the "delta sign") in bone-scan interpretation: concise communication". The Journal of Nuclear Medicine. 21 (3): 211–212. ...in seven out of 100 scans reviewed. ^ Blitz E; et al. (December 2009). "Bone ridge patterning during musculoskeletal assembly is mediated through SCX regulation of Bmp4 at the tendon-skeleton junction". Dev Cell. 17 (6): 861–73. doi:10.1016/j.devcel.2009.10.010. PMC 3164485. PMID 20059955.